A little over a month ago, Budda Baker, a prized recruit out of Bellevue High School in Washington, had Duck fans screaming with joy and Husky fans howling in agony when he announced he was going to play football at Oregon. It sounded great — here comes the next De’Anthony Thomas! But two weeks ago he made a U-turn that would be illegal on I-5 and said that Oregon was no longer his destination. He also was pleased that the Huskies intended to play him at safety, another 180-degree turn from what he said when he was on course to be a Duck. Baker has not yet decided if he will become a Husky. Among other schools, UCLA is in the mix, where he would reunite with his former high school teammate Miles Jack in the Bruins secondary. If he decides on the Huskies, he would line up with another player the Ducks coveted, Shaq Thompson. Unlike Baker though, Thompson never considered Oregon all that strongly. He stated that Autzen Stadium was too small, and living in Eugene was out of the question. 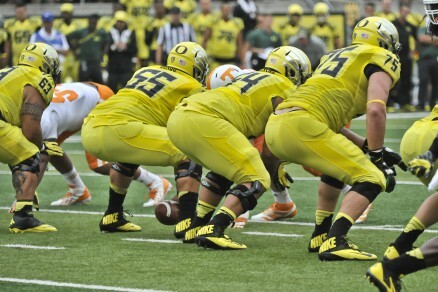 The return of Hroniss Grasu (55) is a huge endorsement for the Oregon program. Baker says that when it comes to “straight up” football, Oregon was it, but apparently it was not enough for him to see it through and become a Duck. Unfortunately, decisions like Baker’s are something that Oregon and its fans see from time to time. The football at Oregon has proven itself over the last decade to be one of the best nationwide, but we have to understand that despite Eugene continually being rated one of the top college towns in the country, the location isn’t for everybody. Despite the ease of modern travel and all the available communications technology, it’s a long way from home for someone unwilling to step to another part of the country, and some people, such as Baker apparently, are just plain city slickers at heart. If Baker ends up at Washington, he will be a most welcome addition. For the last ten years, Oregon has had its way with Washington, but with their new facilities and new coach, the Huskies have aspirations of catching up, not that they haven’t all along. Washington goes into next season minus its starting quarterback, tight end and running back, so getting Baker would be a huge step forward. As for the Ducks, losing Baker does not spell doom for this recruiting cycle. Royce Freeman, a prized 5-star running back out of California, committed to the Ducks very early in the recruiting process and looks to be solid. Arrion Springs, a prospective cornerback from Texas showed signs of slipping away if defensive backs coach John Neal had accepted the head coaching job at UAB. 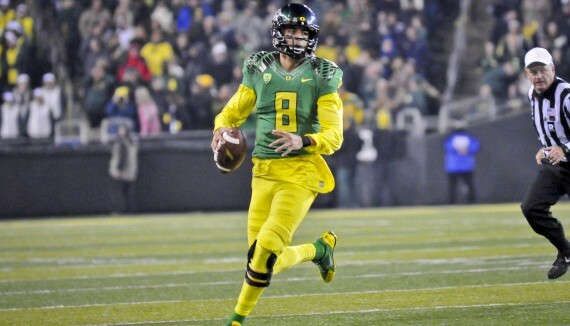 But Neal has decided to stay with Oregon, and so it looks, has Springs. Oregon is still in the hunt for many high profile players as national signing day draws near and one of Oregon’s top three or four classes is still possible. Oregon now is a name brand. Scouting prognosticators don’t do double-checks when they see Oregon on the list of schools a high profile player is considering, and a Duck hat looks perfectly natural waiting to be picked up by a recruit. While all that is true, Oregon still has challenges when it comes to climbing the recruiting rankings. USC has multiple 5-star recruits within walking distance of its campus every year, as do Texas, Alabama, and LSU. Oregon gets one in that galaxy ever ten years or so. The Ducks also self-impose some limitations. 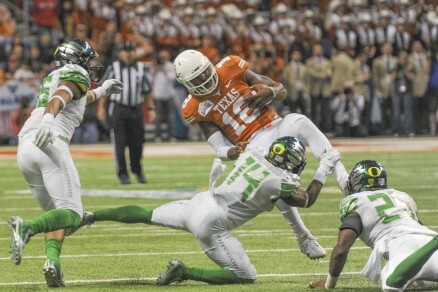 First, the pace at which Oregon runs, just doesn’t work for some players who aren’t ready for the fast lane, and second, the Ducks look hard at the character behind the stars to find players who will fit in. Finally, by maintaining a high rate of retention, the Ducks seldom have 25 slots available to fill out their overall scholarship limitation. While that may result in lower-ranked recruiting classes, it’s not a bad thing. Oregon’s top three “recruits” this year score exactly zero points toward the recruiting rankings. But no coach in the country would trade three available scholarships for Marcus Mariota, Hroniss Grasu and Ifo Ekpre-Olomu, all of whom could — and probably would — be gone had they been with less-cohesive teams. So don’t be dismayed if Oregon’s recruiting class doesn’t crack the top ten. Imitation is the sincerest form of flattery and a lot of schools have flattered Oregon recently, whether by upgrading their facilities, (USC, Washington, Notre Dame, among others, and who would have believed that twenty years ago? ), modernizing their uniforms, running no-huddle, using sign boards to get plays in, or all of the above. Oregon can’t do a whole lot more to upgrade facilities (short of expanding Autzen Stadium, and stay tuned for that one! ), but the reputation for innovation, team cohesiveness and straight up football is firmly established. An ESPN writer in the press box at the Oregon-UCLA game this fall said that it was the most amazing stadium atmosphere he had ever seen — and he has been around. For those who are looking for something different, whether it’s life in the city or something closer to home, it’s okay that the shoe doesn’t fit. The Ducks are doing great not only with those who decide to come, but more importantly, with those who decide to stay.